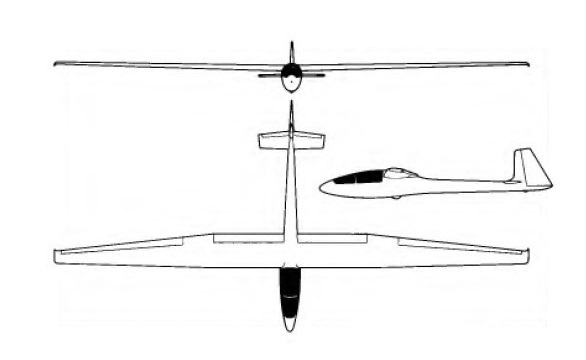 The BG 12 is a single-seat high performance sailplane the sole prototype of which first flew in March 1956, and the basic design was intended especially for homebuilt construction in kit or plan form. Designed by William G. Briegleb, the BG-12 series prototype used a modified BG-6 fuselage. All wing ribs and fuselage bulkheads are cut from plywood and construction is similar to that of a model aeroplane, with spruce longerons being covered with plywood. First production version was the BG 12A, first flown in July 1958, which had a three-piece cantilever wooden wing of 15% thickness/chord ratio and NACA 44-series section, the control system utilising aluminium tubes and castings. 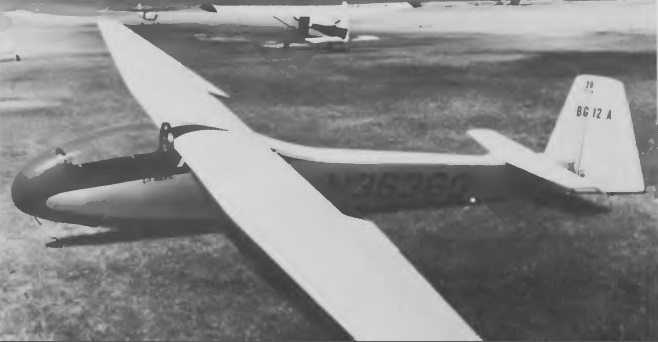 A lighter 2- piece 18% thick wing was developed in 1963 as the BG-12B. Both have flaps for glidepath control. The BG 12B, which first flew in July 1963 and had a two-piece wing with a thicker 18% section at the root, and a welded system of control linkages. The BG 12C was a Standard Class version with a span of exactly 15m instead of the 15.24m (50ft 0in) of the A and B, and this version also featured air brakes, the flaps being used as air brakes on the A and B models at speeds up to 130mph. One flapless B-12C model was built with a 2 piece 15-meter span wing with air brakes to meet FAI/OSTIV Standard Class requirements. The production BG 12BD, which first flew in July 1973 reverts to the 15% wing root section of the A. The BG-12BD model eliminates three degrees of wing twist, accomplishing the same effet by an aileron linkage applicable only in the low-speed range. On all versions, both ailerons and flaps are of wood and covered by plywood, while the tail unit is also of wood; the tailplane incidence can be adjusted on the ground and there are no tabs. The undercarriage consists of a fixed unsprung monowheel with a Briegleb circumferential brake, a shock-mounted nose skid and a spring tail skid. The pilot sits under a large one-piece moulded Plexiglas canopy and has an adjustable seat and rudder pedals. 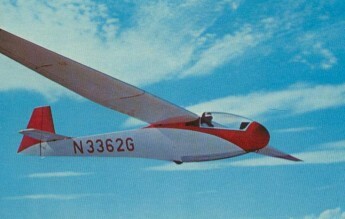 The BG 12-16 was developed from the single-seat BG 12BR, a special contest version of the BG 12 which was flown into seventh place in the 1964 US National Championships by Ross Briegleb. This later damaged its fuselage in a landing accident and was given a new fuselage originally built for the BG 16, a projected new design, thus becoming the BG 12-16 prototype; it made its first flight in this form in June1969. The new low profile fuselage is slimmer than the BG 12's, with a glassfibre forward section containing the pilot in a semi-reclining seat under a two-piece canopy, the aft section of which is detachable; this tapers into a slim rear fuselage of circular section instead of the rectangular section of the BG 12's. A distinctive forward-swept fin and rudder is featured, and the all-flying tailplane, built in two halves, is of metal construction with glassfibre covering, and has two anti-balance servo tabs. L/D max. is 36. The wing and its construction is similar to the BG 12's but with longer span flaps; the flaps, ailerons and rudder are built of ply-covered wood using spruce and Douglas fir. The undercarriage consists of a fixed unsprung monowheel, a shock-absorbing nose skid and a sprung tailwheel or tail skid. 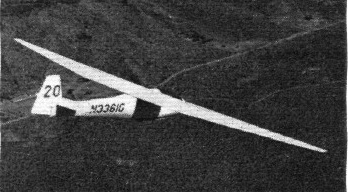 By the beginning of 1978 kits and/or plans for homebuilt construction of 58 BG 12-16s had been sold, although Mr William Briegleb has now retired from sailplane design and ceased all advertising. Kits and/or plans for a total of 257 BG 12s and 58 of the later BG 12-16 had been sold by early 1978; about 100 of these have been completed. As a homebuilt sailplane, around 350 kits or sets of plans having been delivered to customers. A number of modifications were incorporated by individual kitbuilders. 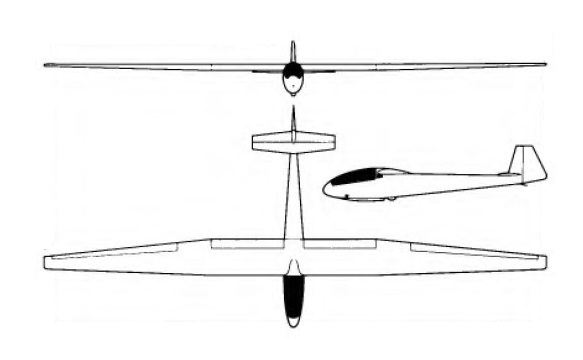 One example is the Niedrauer NG-1 which has a BG-12/16 fuselage with a BG-12B tail and cockpit depth reduced by 9 in /23 cm to 34 in /86 cm, and lengthened to accommodate the pilot in a semi-reclining position.